I think… Iowa State needs to have a more smashmouth approach to the running game. 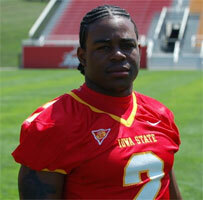 I would love to see Iowa State line up in I-formation with Ryan Kock at FB and Jason Scales at RB and pound the ball. 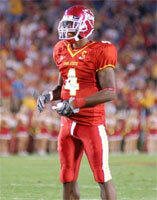 The best running play that the Cyclones had against Oklahoma was the 4th and 1 that Jason Scales picked up 3 yards on. The offensive line blew the Sooners defensive line off the ball, Ryan Kock got a good block and Scales shot through the hole. Ryan Kock shows the sense of urgency on every play that I would like to see from the rest of the offense. The QB draws and RB delays out of shotgun formation requires our offensive lineman to hold their blocks for 2-3 seconds for the play to work. There were 5 running plays that resulted in negative yardage last Saturday. This leaves 2nd and long and 3rd and long and makes it much easier on the opponents to defend. 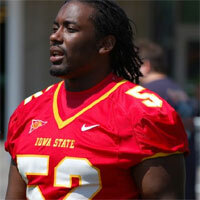 I think…that it is imperative that Iowa State sign at least 3 juco offensive lineman in this recruiting class. The Cyclones will only return two players on the offensive line (OG Tom Schmeling and OG Reggie Stephens) that have played significant minutes this season. The fact that nobody else is ready to play has me worried. Does this starting lineup excite you? I think…Josh Johnson needs to get on the field if he is now ineligible for a redshirt. It would be a shame if he lost an entire year of eligibility for one carry in the second game of the year. 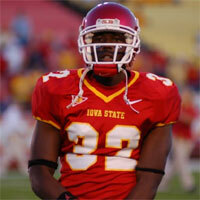 I think…that Deandre Jackson was one of the best cornerbacks in Iowa State history. It is truly a shame that Deandre Jackson tore his ACL this past weekend. 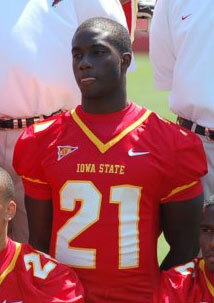 I can’t believe his career as a Cyclone is over, his four years at Iowa State really flew by. Best wishes to Deandre on a speedy recovery and a long career in the NFL. I think…my favorite moment of the Oklahoma game was Milan Moses first reception of the year in the fourth quarter. Milan has battled all the way back from Crohns disease and is back to 100%. I think…Brent “Big Play” Curvey has been an absolute warrior these last two weeks. The improvement of Ahtyba Rubin has freed up Curveball to be the playmaker he was in previous years. He is really going to be missed next season. 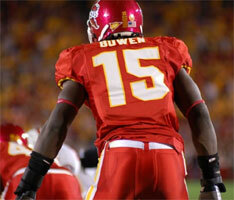 I think…Alvin Bowen and Tyrone McKenzie are the two most talented linebackers that I have seen at Iowa State. It seems like they are in on every tackle. Jon Banks has also impressed me at SAM. The team will be stacked at linebacker next season. Fred Garrin will have had a year in the system and Carper and Raven will be back from ACL injuries. 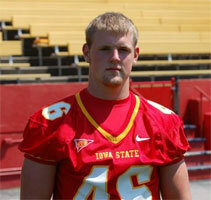 I think…there is a good chance that Kris Means will be the starting fullback for the Cyclones next season. With the linebacker position in good hands, it would make sense to move Means to fullback next season. Kris was a standout fullback in high school rushing for over 1,200 yards in his junior and senior seasons. I think…it will be an exciting day when James Smith and Jason Harris are the starting safeties. Who knows it might even be this week. I think…Texas will beat Nebraska by at least two touchdowns. Nebraska is a much improved team, but the Longhorns have a different level of talent then any team in the Big 12 North. I don’t think…a guy that is fresh out of a half-way house for cocaine trafficking should be a celebrity. If you are going to have Nelson Peterson as a guest commentator at least explain to the public why this is the first time he has seen his son play since 1998. He had spent about eight years in federal prison for money laundering. I don’t think…that Adrian Peterson should have been in the game with Oklahoma leading 27-9 with 7 minutes remaining in the game. Instead of boosting his Heisman chances, it eliminated him from the competition. It is a shame too, he was one of the best college running backs I have ever seen. I don’t think…it should come as a huge surprise that Iowa lost to Indiana. Iowa is not a top 25 team. I am still trying to figure out how Iowa ends up in the top 25 each preseason. The Hawks were a 7-5 team last season. They lost six of their best players from a year ago Abdul Hodge, Chad Greenway, Antwan Allen, Jovon Johnson, Ed Hinkel and Clinton Solomon, but somehow Mark May thinks they are going to be the national champions. What am I missing? This entry was posted on October 17, 2006 at 1:36 am	and is filed under Scott's Thoughts. You can follow any responses to this entry through the RSS 2.0 feed. You can skip to the end and leave a response. Pinging is currently not allowed.